The key takeaway from an IEA SHC Solar Academy webinar held on 14 March 2018: There is still much room for cost cuts along the entire solar thermal value chain. The webinar was organised jointly by the IEA Solar Heating & Cooling Programme’s Task 54 and the International Solar Energy Society. The online seminar, titled Price Reduction of Solar Thermal Systems, was moderated by Sandrin Saile, Project Manager at Fraunhofer ISE, based in Germany. Its aim was to present the various ways in which the cost of solar thermal plants could be lowered to stop the bleeding on the market and give the technology a competitive edge over other thermal energy sources, such as biomass and heat pumps. Solar thermal collectors and their components are commonly exposed to a wide range of climatic influences. Next to UV radiation, factors like humidity, wind, extremely high or low temperatures, salt, sand and other particles in the atmosphere affect the surfaces and performance of these products. 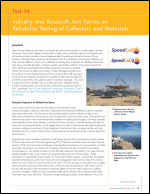 Although these influences are decisive factors for the lifetime and long-term efficiency of solar thermal collectors, there are no validated or binding test procedures for reliability assessment over time or models that allow a location-specific service life prediction. Driving down the costs of solar thermal systems is not just about cheaper collector production. In fact, post-production processes, such as sales, installation and maintenance account for up to 50% of the price that end consumers pay. This new IEA SHC Task, Price Reduction of Solar Thermal Systems, will investigate these other factors and find ways to reduce systems costs. The Task’s kick-off meeting was hosted by Fraunhofer ISE in Freiburg, Germany the end of October. Researchers and industry representatives from all over the world participated. Researchers have worked intensively for one-and-a-half years across national borders to find ways of reducing the costs of solar thermal systems and making them more attractive to end users. 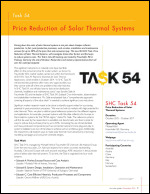 The members of Task 54 of the IEA Solar Heating and Cooling Programme, Price Reduction of Solar Thermal Systems, have discussed the effects of standardised product designs or changes in product offerings on cost structures. They have also analysed the entire value chain from component manufacture to system assembly and installation to help identify cost-cutting potential. This is the first time that methods of Process Cost Analysis are being adapted for the solar thermal business.